I'll give it a go as it's a funny premise but 24 episodes being signed off shows CR has a lot of faith this show will do well as I believe they're on the committee for this one. And so it begins with the MC dying to protect his friend from a robber, never having a girlfriend in his life. But instead of going to heaven, he's in another world as a slimeball. He's acquiring lots of skills, but unlike with the other isekai MCs, he's not quite overpowered, not with the body he has. And then he has is informed of what's happening from that dragon as he's an unusual person, and that guy was imprisoned by the lead heroine of this show. Seeing that they are on friendly terms that they became friends. The mood certainly shifted quite a lot from the MCs death in Tokyo to his reincarnation. I saw the preair yesterday but watching it in a much higher quality made this a better experience. Classic isekai tropes here with the MC getting transported to another world after being reincarnated as a...slime. 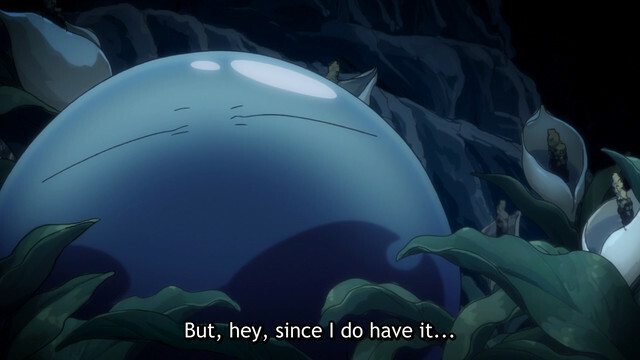 I like the humor of this so far although it may take me awhile to get used to the slime's voice. Glad they got a good amount of humor into this episode though as that was I was looking for. Neat episode so far. And it's 2 cour so plenty of storytelling to come. The first episode introduces us to 37 year old Satoru Mikami who's worked up the ladder at his job and is finally making decent money. After all that the only thing missing in his life is a girl friend since he's never had one making him a virigin. Not like their is anything wrong with that. 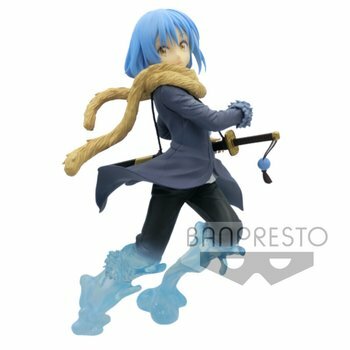 One day he's called by his kohai so that he could show off his girlfriend and because of that he gets stabbed trying to protect him, but before that gets to choose the skills before he is reincarnated into a slime. The rest of the episode is spent with Satoru now being a slime testing out his new body and seeing what he could do exactly with it. He finds out he can digest stuff like herbs to make potions and other materials that are very valuable. After exploring the cave he runs into a dragon who's been sealed for over 300 years and this dragon helps Satoru how to see. It's this part that i found the funniest as the dragon turns out to be a tsundere. After being sealed for so long the dragon jumped at the chance when Satoru mentioned being friends but being a tsundere didn't want to show how happy he is. When it comes to the first episode it wasn't bad and some of the funny parts where hits and miss, but i was able to enjoy some of it. The op however spoils some stuff... Im going into this series blind and they show that he can take a human form? I would have like to seen that for myself as the series went along not be spoiled about it. Anyways guess i'll give this series a shot since im curious how he will take that human form and see what other abilities he can gain? Wasn't expecting much out of this and the LN never interested me before, but it seems pretty interesting and the animation looks pretty good especially during those fight scenes in the OP at the end. What really surprised me was the outro. There are some things and characters shown that show up much later in the series than I would have expected. Shows things that happen way past where the manga is now at least. Which begs the very important question, how many episodes will this be? My only worry is that they will be trying to sprint through all the events instead of giving them the time they deserve. Glad to see this show adapted. hope it will do the light novels justice. 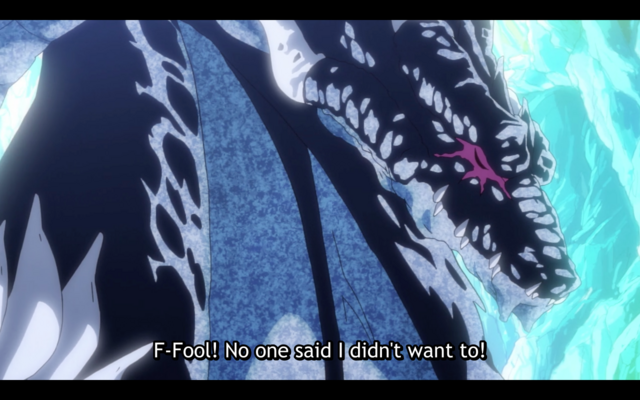 I'm glad I wasn't the only person to find the Tsundere dragon funny. Also, the outro seemed a bit spoilery, but having not read any of the written materials I can't point out what was. If ignorance is bliss; why aren't more people happy? Well... it had to happen. You can't be an anime fan without eventually watching an isekai, and this one is my first! A lot of flashy visual effects shown as if this show tried to be more "enticing" for what it is. I thought I've been playing Neir:Automata for the first ten minutes of this thing! Otherwise this is going to be as boring as I expected. I've read a bit of the LN so I know that Best Girl [NAME AND ADDRESS WITHHELD] will come and make everything better. But for now, lackluster city. Ah, well, I'm an easy sell for most D&D related stuff. I kind of look forward to getting the Slime POV on the game settings and mechanics. Anyway, I am looking forward to it, hopeful as ever that it will be a good series. Fingers crossed. The man kept his word and destroyed it without peeking, a true friend.